Standing on the furthest point of the spit of sand that pushed out in a bay, I turned to Christian. "Impossible," I said. We looked at the river, more of a lagoon really, with crashing waves about 30m wide. And, having a track record with rivers, I knew it was out of the question. 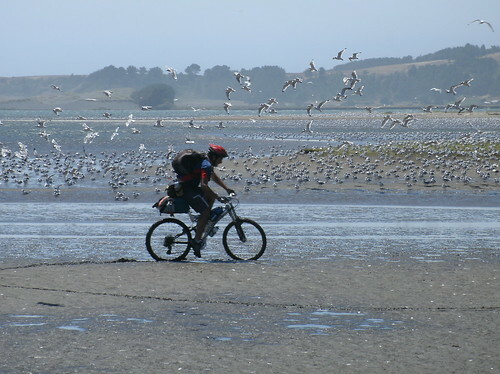 The most dissappointing aspect of this was that we (myself and 3 Chilean hardnut cycletourists) had spent a good 2 hours riding our bikes through cow fields, carrying them over fences, and pushing them through loose sand. And now it looked as if we would have to repeat the journey in reverse. I should have known not to trust these guys as the previous night their "tent" had turned out to be little more that a few bits of tree and some transparent plastic sheets. They did have a guitar, a drum and some shakers. 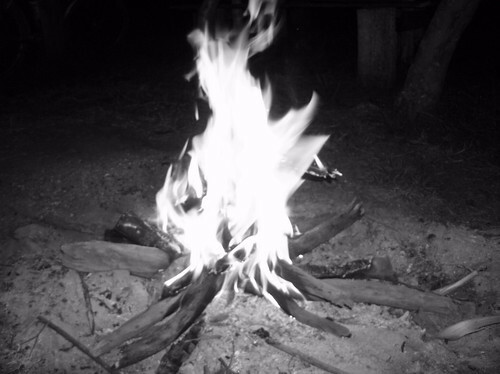 So we built a fire and had a sing-song. But then we'd continued on our way and realised that the bridge was a 20km detour inland. Nevermind, I thought. But these guys were built of stuborn stuff. When we reached some little yellow fishing boats we considered stealling one, but decided against it. After pushing the bikes back, tediously, through the sand we found a group of fishermen at the boats. We asked for a lift and they agreed. It took for people to load my bike aboard and then I jumped on and off we went. Two eager Chilean lads did the rowing. Hard work I imagine. On the other side of the river I hopped off and they went and set their nets before picking up the Chileans. After another 40mins of pushing through san we reached the pitiful excuse for a road. The coastscape here is incredible with amazing little sany coves. The downside is that between each smugglers bay is bookended by a crazy steep descent and crazy steep climb. We reached Cobquecura and plonked ourselves down in the Plaza de Armas. There were some table-football tables so we had a game or two. 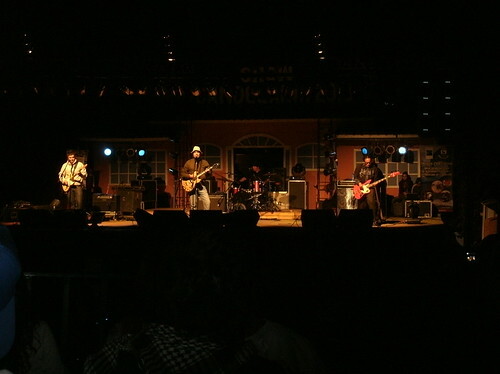 Then we saw a poster for a band called "Los Tres", that the Chileans told me were fantastic, playing that night. So we found someone's backyard to camp in. At first 1000 pesos but then the owner liked us so let us stay for free. There were a bunch of kids camping there drinking wine and coke ("jote") and playing loud reggaeton from an SUV that I blocked in with my tent. Los Tres were interesting. Think Dad Rock: Rolling Stones leaning towards Status Quo with a bit of Chilean folk thrown in for good measure. But the crowd was awesome. They knew, and sang, every word to every song, danced, jumped around, shouted, screamed and this made the atmosphere electric. It was a big gig for a small town and everyone was there from 1o year olds to grandmothers, and they all seemed to be having a whale of a time. It cost 1000 pesos for a ticket but my Chilean friends negociated it down to 800, about 1 pound. Then we went back to the campsite to whip up a bbq and cook some longanisa (sausages) and make sandwiches with them choripan. Cañete to Tomé: Sergio, a fantastic guy! Cycling up and down hills in forests. Often overtaken, a little too close, by great long trucks full of tree trunks. I looked for a place to camp between the rows of pines. Then I thought. Screw it, I'll go to Caranilahue. 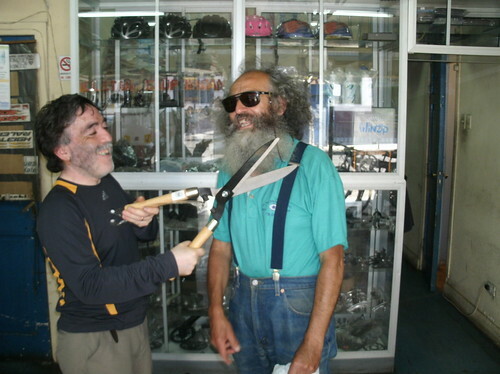 I cycled around a bit and struggled to find a campsite or hospedaje so I asked for dirrections in a bike shop. Sergio, the shop owner, would have none of it. I was to stay with him, he said. Seriously, what a generous man. He introduced me to his lovely family, gave me food, a shower, internet, washing machine, and a bed for the night. I listened to his son and his friend practising trumpet and viola for a concert the following night. He was constantly thinking of new ways to be generous. And to make me laugh. He had great fun teaching me Chilean slang words: Modismos. In the morning, after a great breakfast, Sergio insisted we take my bike into the workshop for a tune-up. I began to fix the minor damage to the front brake. I thought I would just bend it back in place, but Sergio replaced the bent part and rebuilt the whole thing. And put new blocks on. Then Paulo, Sergio's assistant, cleaned the whole bike, tuned the brakes, adjusted the chain, plus oiled it, tightened all the bolts, and pumped up the tyres. I tried to pay but he would accept nothing, not even for the parts. Then it was time for a massive lunch of pasta and eggs. Sergio then decided that it was too dangerous for me to cycle to Conception so my bike and all my bags went in his pickup truck and he drove me to his other shop. Then he, his wife Nancy and I, went out for Once, hot-dogs and juice. Again, I tried to pay but he wouldn't have it. He said that I had to come with them to the concert. I was exhuasted by it, and all the clapping, but then we had to go and watch a football match at Sergio's brother's house (on telly!). The match was in a stadium nearby and on the way back we drove past with all the crowd spilling out. Then, I slept in his flat above the shop. In the morning, another huge breakfast and sandwiches for a packed lunch. "Thank you," didn't come close to being enough, but it was all I could say. And to tell him how generous he is: a massive understatement. There were a few options. 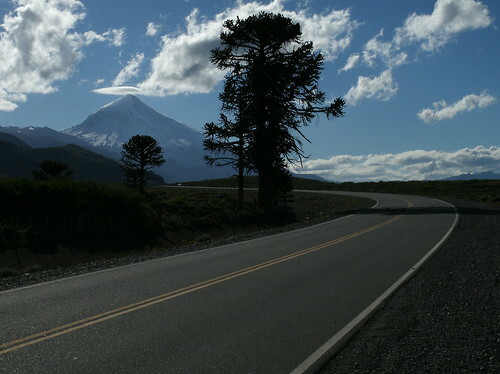 The big roads: Ruta 5 in Chile and Ruta 40 in Argentina. Neither really appealed. So instead I headed out to the coast. 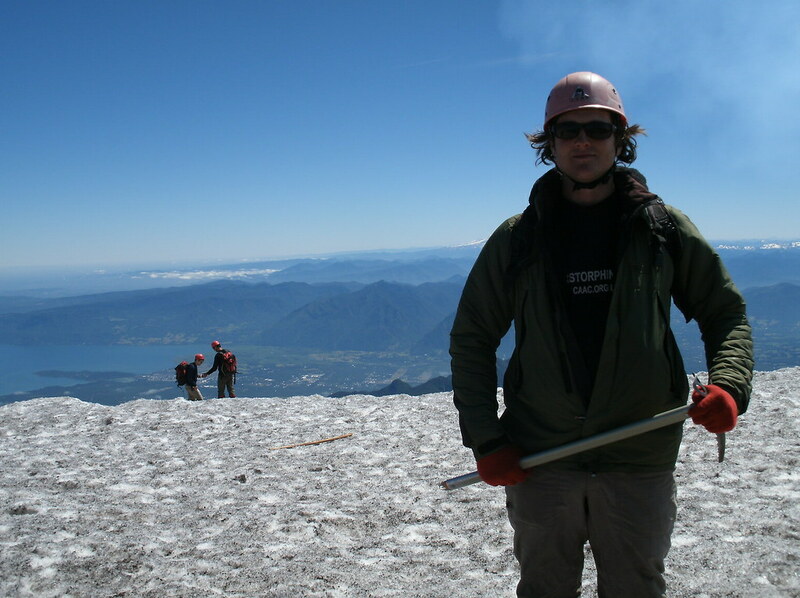 First beside Lago Villarrica, with Volcan Villarrica behind me I arrived in Villarrica (the town). 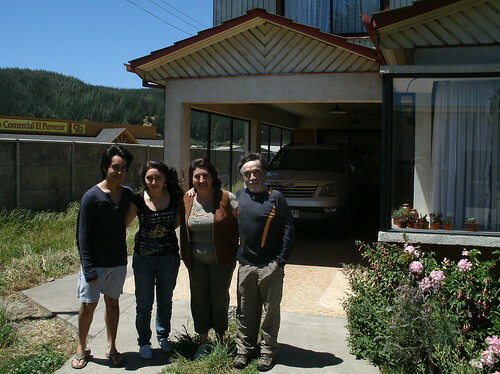 Next I headed into a westerly wind to Freire and up the motorway (shudder) to Temuco where I stayed in a Hospedaje. Then, further west along the Rio Imperial to Nueva Imperial. Then to Carahue which has an impressive collection of antique steam traction engines. Soon enough I crossed the river and struck north on a dirt road. I camped beside the road in a forest. Then. I had one of those mornings when everything conspires against you. 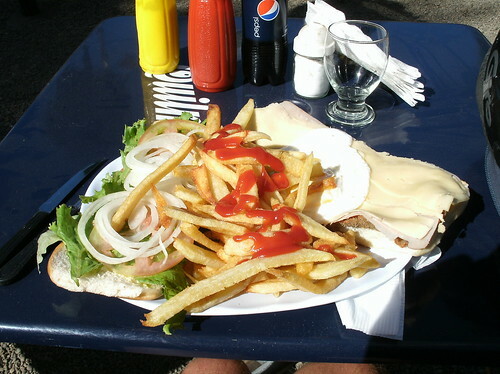 Firstly food. I had eaten all the bread, oats and biscuits so the only option for breakfast was to cook on the stove. Which I was too lazy to do. Then, as it was a hot sunny day, I drank all the water double quick. Throughout my thirsty, hungry morning I headed along a hilly forest gravel road in very bad condition. No rivers, no houses and no shops or cafes. On the up hill sections I was slow enough for the horseflies to catch up. They love a sweaty cyclist. Just as good as a horse as far as they are concerned. I will have you know, I'm rather talented at catching and squishing horseflies left-handed. (Horseflies if you are reading this - watch out!). Anyway, I ended up punching myself in the face a few times whilst waving my deadly-horsefly-killers (ok, arms) around. The only effective relief came from nailing downhill at stupid-km/hour (I don't have a speedo). With the quality of the road (terrible) I should have been more careful, and I ended up hitting a patch of loose gravel and my front wheel, which doesn't have much grip now, went one way, and I went the other. I took a spectacular header. Rolled over a few times. Came to a stop in a crumpled heap. Damage: grazed elbow, grazed wrist and minor bending damage to part of the front brake. After a few more hours of suffer, sorry, cycling, I reached Tirua and dived into the first cafe for a feast (Cazuela and about 5 bottles of coke). From there I managed to push on as far as the lovely Lago Lleu Lleu (which is just too many vowel sounds for my liking!). I found a great campsite which would have been: 1 pound 90p with cold water showers, a view across the lake, a picnic table and a fire pit. Instead, it was free because the owners were away and they turned the water off. So just the lake, picnic table, and fire to enjoy. Plus the fetid bogs. This morning, unshowered and ripe, I dived in the lake. Woken up by the cold swim and a couple of coffees I scooted along to Cañate. Coast has its interesting moments but I have been spoiled by Patagonia and the Lake Districts. Juan Sebastián Elcano is the first person to circumnavigate the globe. He was second in command of Ferdinand Magellan's expedition with 5 ships. Magellan was killed in 1521, in the Phillipines, in a battle. The voyage left its legacy with the Straights of Magellan between Tierra del Fuego and mainland South America. It also took its toll. Of 241 men who began the expedition, only 17 returned to Spain alive. Thomas Stevens: The Grandfather of Round The World Cycle Touring. Tom, an Englishman, was so keen he left to cycle around the world before the modern bicycle existed. Instead he headed off on a Penny Farthing. As the story goes, he left San Fransisco with a spare pair of socks, a coat (that he also used as a sleeping bag/bivvy), and a Smith & Weston 38! He crossed the US and got a steamer to Liverpool and pedalled his way across Europe and Asia with a devious route using a few ships. In recent years a loony called Joff Somerfeild has repeated the feat and toured the world on a penny. He writes a good diary too check out his crazyguyonabike.com page. Captain Joshua Slocum. First singlehanded sailing voyage around the world. Captain Slocum wrote a fantastic book about his adventure aboard the Spray called Sailing Alone Around the World. Its a great read and includes his maps for the carribean being eaten by a goat, flying fish jumping on board and hiring an Irishman to pretend to be a shark expert. The Spray, which he built himself, was fitted out with a wood burning stove and a small cabin, and he found his way by taking noon sun sights for lattitude and using dead reckoning for longitude as he only had a $1 tin clock without a minute hand. His journey involved crossing the Atlantic 3 times, and rounding Cape Horn. Wiley Post. A one-eyed Texan aeroplane nut was the first man to get in a plane and fly around the world alone. Took him 7 days, 19 hours. Go him! David Kunst. 450 years after Magellan's expedition, someone had the idea to circumnavigate the world on foot. Mad bugger! David set off with his brother John. They walked across the USA, then flew to Portugal and walked across Europe and as far as Afganistan. There, John was shot dead. David was shot in the chest and survived by pretending to be dead. He resumed the walk with another brother called Pete. They got as far as India but couldn't get a visa for USSR. They flew to Australia. After a while Pete went home but David continued walking. 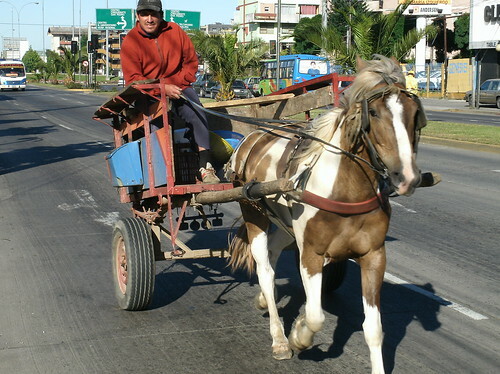 The mule that he used to carry his supplies died and he had to pull the cart himself. A kind school teacher called Jenni stopped her car and offered to help and hitched the cart on to her car. David walked alongside the car for the remainder of the Australian leg. Jenni and David later got married and lived happily ever after. Well! No one has ever successfully completed a "true" circumnavigation by human power alone. Guiness World Records state that the journey must cover 36,788km, cross the equator and each leg must start where the last finished. 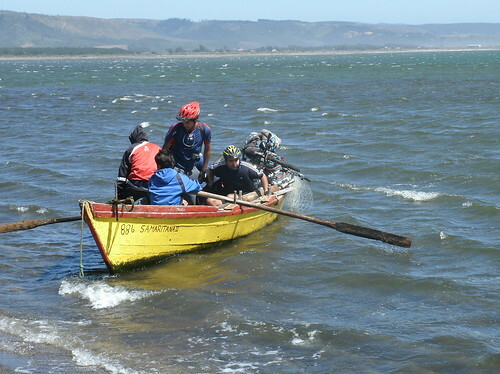 It can be done with rowing boat(the Atlantic, Pacific and Indian Oceans have all been rowed across) and bicycle (there's many a RTW cyclist out there). But who will do it? Maybe you? Knowing that I would spend the day today climbing a volcano, and that I had to be at the minibus for 6.30am, I got an early night. Trouble was the neighbours didn't. Got about 4 hours sleep before the alarm clock beeped. So, a little bleary-eyed, I bundled into the minibus with the other punters (mostly Israelis). Then the choice: walk up to the top of the ski lifts or pay 5000 to go up the lift. It was a fine walk. The climb up was generally a snowplod in perfect conditions. Neither crampons or ice-axe were really necessary and the guide didn't really add much either. At the top we messed around taking silly photos, ate some food, looked as deep as we dared into the crater, and enjoyed the stunning views, especially of the other nearby volcanos Lanín and Llaima. Then we slid back down on our bums. I was hoping to find a guide to climb Volcan Lanin in Junin de los Andes but everything was shut between 1pm and 5pm. I arrived at 1.10pm and I didn't want to waste that much of the day there as it was a fairly grim spot. 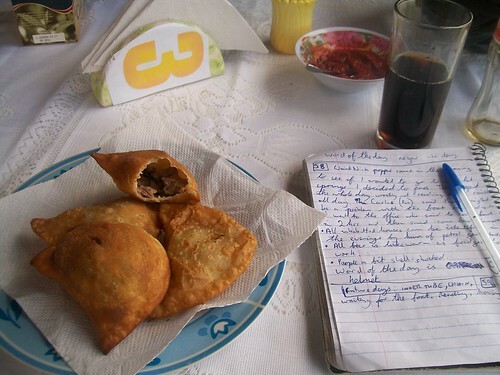 I did however stop at a roadside cafe and have a platefull of empanadas which are a great snack food for cycling. Then I pushed on as far as the Chilean border for my 5th border crossing. Along the way the road returned to probably the worst quality gravel road so far. 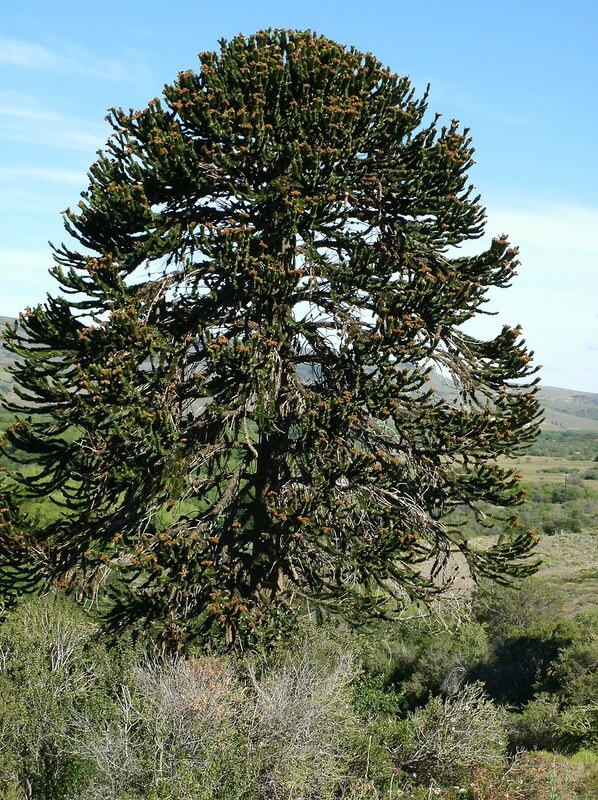 However it was hard to be distracted because I was cycling through amazing forests of Monkey Puzzle trees and Volcan Lanin was looming larger as I pressed on. As this was a national park there were heaps of signs everywhere saying NO CAMPING so I was keen to find a very discrete spot to camp. It grew darker and still I didn't find anywhere and then the forests disappeared to an area of low bushes. When I reached the border at dusk there was a campsite and I stayed there. As I turned up a Mapuche man had a grill going with a few sausages left on it. He sold me one in a sandwich and then I pitched my tent in the dark and slept. The next morning I felt a bit lathargic and had some unpleasant bowel movements. Nevertheless, I pressed on. It was one of the hottest days so far. In fact rather too hot for cycling as I am not used to the heat yet. I stopped for a long lunch at a roadside cafe. Then continued along a road that is in the process of being paved. Whilst this process goes on it is in terrible condition with perilous loose gravel and sand. By the time I reached Cararrehue it was about the hottest time of day and I was exhausted and thirsty. I bought a litre of fizzy orange in a shop and colapsed on my back on the concrete and poured it down my throat. Despite only being halfway through the afternoon I decided to camp there. I asked a kid if there was a campsite and he said he would take me. I set about following him and asked how much the campsite cost. He said 500 pesos which is about 60p and much less than any campsite I have ever been to. Well, he just led me to the football pitch, near the river and asked for his 500. I had to laugh at that and paid up and camped in a really nice spot. Still feeling a bit iffy I just ate bread and jam for supper and read a little of my book before sleeping. Today, I made a relaxing cycle to Pucón being constantly overtaken by racing cyclists. As I reached Pucón I saw many runners too. "Wow," I thought, "What a sporty town!" Then I saw a poster: Domingo Iron Man de Pucón. I'd love to stay and watch but not sure I can justify staying here for another 4 days. 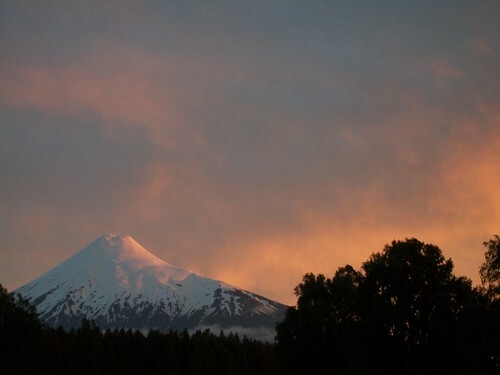 So, I am installed in a campsite here and I have just registered for a guided trip up Volcan Villarrica tomorrow. Should be fun. Watch this space!!! 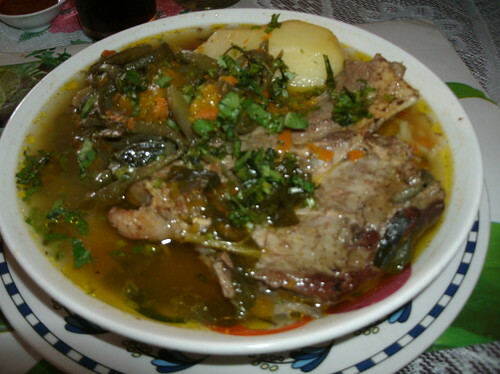 From Entre Lagos it was back on a paved and winding road that led to the Argentine border. It also led through a fantastic national park. I camped with Chris (he's just toured Route 66 in the USA and now finds himself down here...) in a great little meadow off the road behind some trees. The next day we set off up the never-ending hairpins until...er...they ended. Then, in the pouring rain, we shot down to Argentina, past the gorgeous Lago Espejo (mirror lake) and on to Villa Angostura. A nice enough little touristy town. Rain treated my tent to a well needed shower (to remove bird excrement) and I had a shower too. In the morning I waved adios to Chris and set of up Ruta 234 (camino de los siete lagos) and set about counting the lakes. It was a hot sunny blue sky day and the scenery was out of this world. Only, sorry folks, I had no camera to record it. Nevertheless, I will try to describe instead. Basically you've got a gravel road, then on one or both sides a lake of deep blue water. Behind that you have either forested mountains with rocky outcrops poking out above, or higher more distant snowcapped peaks. When there is no lake beside the road you have raging rivers with big cascading rapids, or forests with unusual native trees that I don't recognise. "There is a big party by the lake tonight, man," and then with a conspirational wink ",there'll be muchas chicas..."
So, well, basically I was persuaded and spent the night drinking a couple of beers on the lakeside beach, playing guitars, eating bbq'ed cow bits, and watching the view, and the sunset. Today the road was equally impressive but was soon paved all the way to SMdlA. When you hit the crest of the last pass it is a thrilling ride down to the town. The best moment for me was rounding a turn to see the full length of Lago Lacar and at one end San Martin. 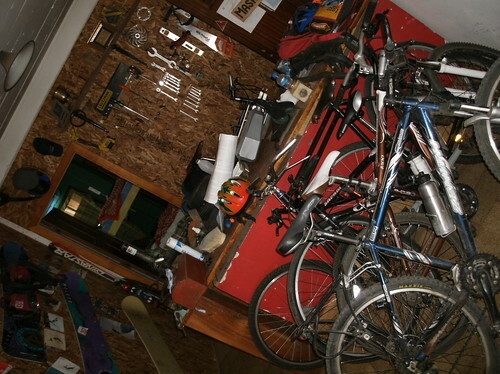 I took in the town, interneted a bit, got a sandwich, bought a new camera, and was about to leave town when I passed "Bike Hostal" a hostal full of bits of bicycles and with a workshop at my disposal. The owner invited me in and we sat in the garden drinking mate. Oh well Junin tomorrow. This post focuses on some close shaves. So, I suppose it is appropriate to begin it by announcing that after over 70 days of trying I have abandoned my facial hair experiment and shaved the pathetic beard away. Damn it feels good. I will warn you now that this might all get a bit dramatic later but, if you are of a nervous disposition, don´t worry. The only damage was a bruised hip, cuts and bruises on my shins, a sore knee and a soggy camera. Puerto Montt tried to do me in. Twice. I won't hold that against it. However, it is an ugly port town. Makes Portsmouth look like Venice. The first attempt on my life came with my arrival into the town. I was overtaking a row of cars down a steep hill when my front wheel hit a patch of oily water and slipped from under me. Bike and I slid our separate ways. Damage: bruised hip. The second failed assassination occurred when I was on foot. I was looking in shop windows, hoping to find something tasty to eat, and fell (cartoon style) into a man hole. I was held up by my shins and swayed back and forth like a punch bag. Damage: cuts and bruises on both shins. Having escaped with my life I made for Puerto Vargas. Why, oh why, hadn't I stayed here instead? It was a delightful lake side town 20km further. As I poodled along the side of Lago Llanquihue I wondered, among other things, how to pronounce that name, whether Volcán Orsorno would come out of the clouds, and whether there would be somewhere to eat soon. Answers: Yankeeoeh, yes(!!! ), and yes(!!!). Volcan Orsorno is a beautiful volcano, very similar to what a child would draw if you asked him, except without red and orange crayon lava flying out the top. Its best enjoyed drinking a huge glass of fresh raspberry juice and eating a giant hamburger. I cycled past it mesmorised. Then, I took a road that looked to me like (but wasn´t) the road to Entre Lagos. After 20km I camped by the side of the road, ate some bread rolls and listened to a dog bark at my tent for over an hour. In the morning I packed, in gorgeous sunshine, and continued on my way. The gravel road was fine for another 20km but then started to narrow. 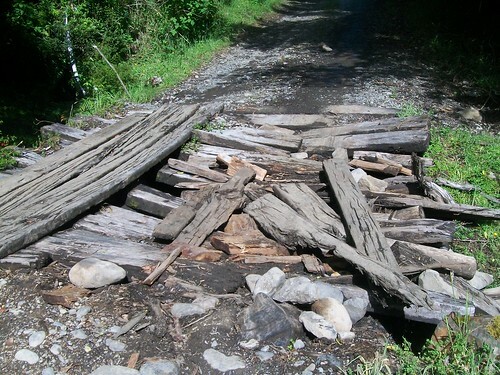 Then there was a bridge in very poor condition. Then there were some very boulder strewn parts of the road. Soon I began to deduce that this road wasn´t particularly popular with cars. The scenery, of forested mountains, was wonderful and there seemed to be a few farm buildings here and there. Then I reached some very large puddles and took exceptionally pedantic measures to keep dry feet (Ha!). Then, with grass growing out of the middle of the road, I nailed it down a huge steep hill which ended up going straight into a wide river. At first, it seemed that the river was wide but not particularly deep. I wheeled out the bike a bit, but then decided it was too deep for my boots. Back on the bank, I took off boots and socks, and changed out of trousers into shorts. Barefoot, I started to cross the river in shallow, but icy cold, water. About three-quarters of the way across, I realised that it was starting to get a good deal deeper. The current was pushing into the bike and, up to my waist in water, I was struggling to stand up and pull the bike. Then, as my panniers are watertight, the bike became afloat. Shortly afterwards, trying to hold on, I too lost my footing on the riverbed. Holding on to the bike with one hand, and attempting a little of the old one-armed-doggy-paddle with the other we rushed down stream perilously fast towards some rapids. I managed to get a footing and heaved myself and the bike up on some rocks. In seconds we were about 100m downstream from the road (if you can call it that!). Now in shade, I began to shiver. My feet were especially cold, so I wrung out my socks, and poured out the water from my boots and put them on. Then, I had to take off the panniers and scramble over the rocks to the road with them, and then go back for the bike. Damage: bruised knee. Camera was in my pocket and got a good soaking (I hadn't expected the water to come above my knees) and won´t switch on. Hopefully it will work once it dries out. After that I faced another 10km of terrible road, not even gravel now just mud. But us Hubbard's are built of stern stuff: so I headed on. In the end I reached a meadow with a few cows grazing in it. The road just ended. Dead end. A Chileno appeared, out of the woodwork, and I asked him if the "road" led through to Entre Lagos. He said, "You have to go that way," and pointed in the way I had just come. "But you will need a horse. It cannot be done on a bicycle," he advised. Then he added helpfully, "There is no bridge over the river." Arriving in Quellon fresh off the boat from Chaiten was a bit of a shock. Despite only being small writing on the map it was bigger than any town I've been to sinse Punta Arenas. I took it slowly along to Chonchi. The whole way along there were houses by the road or barbwired farmland. There are gently rolling hills but that's not a problem if you've got the Carretera Austral still in your legs. Chonchi is a delightful little fishing port with colourful buildings. I walked into a shop and bought a bottle of fruit juice and asked if there was a campsite. "Yeah," the shop owner said, "Juan Carlos´s house." He said it as if everyone knew that. The selfsame Juan Carlos was a funny little character with a beard that made him look a bit like a leprichorn. The campsite, in his back garden, was a nice enough spot and I met an american couple of cyclists heading south. From Chonchi it was a short 20km hop to Castro, the capital of the Island, where I am now. I headed out last night in the hope of finding some traditional Chiloe folk music but first I went for a pizza. Whilst getting my bill a pair of Brazillian brothers and a German guy asked if I wanted to join them for a drink. We had a couple of beers and the one brother, Rodrigo, kept getting extra chairs and inviting Chilean girls to come and join us. Good spanich practise. Then we all climbed into taxis to go to a nightclub a few miles from the town. The place was thumping out Reggaeton: sort of a beat heavy mixture of Dancehall with Merengue which origionates from Puerto Rico. There is also definately a hip-hop and R&B influence to Reggaeton with many a Beyonce remix with a gravel voiced rap interlude (what I think of as urban music's equivalent of the guitar solo). All reggaeton songs have the same drum beat which, depending on your viewpoint, is either infectious or infuriating. In short, reggaeton is pretty dreadful. Nevertheless it is very popular across Latin America and also seems to have a growing toehold in the USA and Europe. I think the reason is that it has a strong beat to dance to. And dance I did. Although, because I was wearing hiking boots, I was unable to unleash the finest moves held in my reportoire. Well, that's my excuse. Later, having sampled the dangerous chilean poison Pisco Sour and its partner in crime Piscola, I walked home, getting fairly lost in the middle of some farmland when I attempted to take a shortcut. I arrived back at the Hospedaje Bellavista just as dawn was breaking and found the front door locked. I rang the bell but when there was no answer I tried pushing one of the windows open. I managed to slide it open enough to climb inside but there were a range of little orniments balanced on the window sill. So, whilst balancing tentitively on the window ledge I had to move them all out of the way. I spent the morning comatosed. Next up. Here is a nice little charango piece from Nicolas de Penna who I met in Chaiten. The recording was made in the back of his mini-bus. The song is called Dos Palomas (two doves). Next more interviews with fellow cyclists. Brett from South Africa Sorry, it was a bit windy and I forgot to use the windshield... Made in the campsite in Cochrane. Brett is a lively character with lots of stories up his sleeve. Monika and Thorsten from Germany Thorsten and Moni are a very friendly and generous couple who played leap-frog with me for a while. We camped in El Blanco at the confluence of two rivers, 30km before Coyhaique. 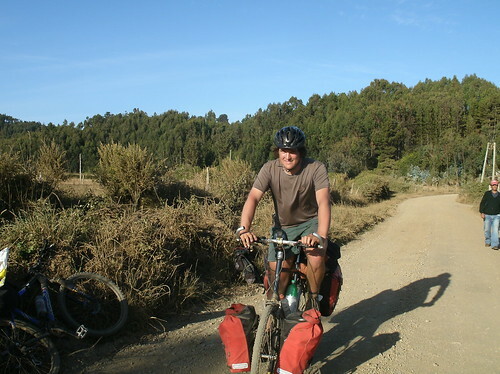 Thorsten is a journalist who writes for cycling magazines about his tours. He takes fantastic photgraphs. Graham from Cumbria in the UK Graham is riding a Dawes Audax, a fast tourer, with very minimal equipment tucked into 2 panniers. He's cycled from Prudhoe Bay in Alaska. We met on new year's eve and shared a few drinks in a bus shelter not far from La Junta. 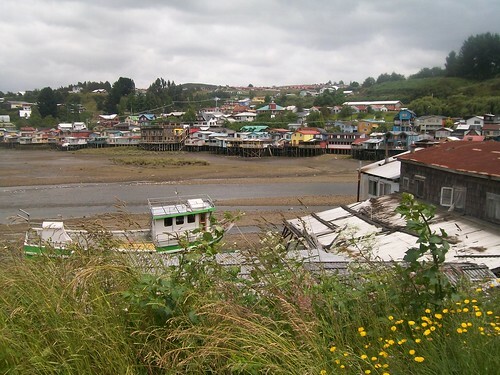 From the 30th April 2008, Chaiten, a port town towards the north of Patagonia (and for me the end of the Carretera Austral), was hit by a series of low and medium intensity earthquakes. The 7000, or so, people of the town began to worry. At half past midnight on the 2nd May 2008, their worries were validated. A loud bang jolted them awake and they felt, and saw against the night sky, Volcan Chaiten erupt. The volcano, thought to be extinct, was 10km from the town and the plume could be seen 180km away. The water supply to the town was soon cut off to prevent poisoning. The largest evacuation in Chilean history, involving navy ships, left about 1000 people in the town that night. On the 6th May there was a secondary erruption and by that night there were only 20. The rivers filled with ash and the town was flooded. A new branch of the river formed and wiped away hundreds of houses. Of the houses left, many are severly damaged by the mounds of ash. Now, 20 months later, Chaiten is a ghost town. But people do live there. About 150. A few supermarkets are open. A few hospedajes and a few restuarants. A man I spoke to said, for the first 6 months after coming back he had not unpacked, just in case he had to go again at short notice. The government have now decided that Chaiten will not be rebuilt and instead Santa Barbara, about 6km away, will be expanded to replace the town. As yet no new houses have been built in the region. EL GOBIERNO NOS NIEGA LA LUZ Y EL AGUA. AQUI ESTAMOS HACIENDO PATRIA. The government refuses us light and water. We are making our homeland here. Chaiten is not dead. We will return. ZONA 0. CERO LUZ. CERO AGUA. CERO APOYO. Zero Zone. Zero light. Zero water. Zero support. CHAITEN NO MORIA SEGURIREMOS CONSTRUYENDO. PATRIA AL SUR DEL MUNDO, POR ESO EXIGIMOS. CAMINO CHILE, AHORA!!! VIEJO PASCUERO: EN ESTA NAVIDAD TE PIDO LA LUZ Y EL AGUA. CHAITEN VIVE! Fater Christmas: for this christmas I ask for light and water. Chaiten lives. NO ROBEN. Don't rob us. Thief: you are a son of a female dog. OYE LADRON ERES UN ZANGANO Y CANALLA. AHORA ESPERA EL CASTIGO DE DIOS. PUTRETE! SENOR, PROTEGENOS DEL VOLCAN, DEL RIO Y DE LOS MALOS POLITICOS. AMEN. Lord, protect us from the volcano, from the river and from the bad politicians. Amen. As it lashed down with rain I headed towards the sound of a generator, and sure enough, found a supermarket. I bought a packet of biscuits and was munching away when a minibus came along. They were heading up to visit the Volcano and wondered if I wanted to come along. I said I didn't really have the money and the tour guide asked, "What else are you going to do? Sulk around here?" So we drove along the last section of the CA and into Pumalin Park (officially trespassing as it is now closed to the public). We drove across a part of the road that has been widened as a makeshift airstrip. A cartoony cherry-picker control tower, made everyone chuckle. As we drove, the sky cleared up a bit and we had a sight of the decimated forrests. Our guide pointed out that the giant rubarb plant I have seen everywhere is edible, even raw. We came to a point were the road is destroyed and stopped. From here we had to walk. The first thing I did was get some giant rubarb and eat it. Its disgusting just so you know. The road was split into several sections by landslides and rivers was strewn with volcanic rocks. Lumps of glassy black Obsidian were everywhere along with the solidifyed white frothy lava: pumice stones. After crossing and recrossing the newly appeared river, we reached a view point for the volcano and waited patiently for the clouds to part. While we waited, I asked our guide about the Pumalin Park. The area, which has a unique ecology, has abundant mineral wealth and so industrialists wish to exploit this and also develop forrestry. This is one of the primary reasons to extend the Carretera Austral: to better facilitate the industrialisation. The granting of sanctuary status has forestalled this threat for the moment. I also asked about Chaiten and tried to peice together the events of the eruption. I asked about insurance. People were fighting in the courts but many companies refused to pay out. Many people did not have home insurance. Also many complex issues. The town people had to fight in the courts to have the river properly levvied. On the way back from the volcano we stopped off at Santa Barbara which is a lovely little secluded beach, over shaddowed by a forrested hill called Vilcun. I tried to imagine it growing to the size of Chaiten. The guide, Nicolas, pulled out a charango and played a few songs, including one he had written about the beach, and "Don't worry about a thing" the Bob Marley tune. Later, in the back of his van, I made a lovely recording of a traditional andean song called "Dos Palomas". I went for dinner in a place called Turco, one of the few open. Miranda and Pete, who'd also come up to the volcano, were there so I joined them for a good chat, a few beers (luke warm as fridges don't work) and a big plate of fried salmon. They are a pair of teachers working in Columbia and very friendly. Despite my protest, they paid for dinner. (Thankyou very much guys!) Feeling very happy and content (full stomach, faith in human kindness) I walked back to the Don Carlos Hospedaje in starlight (street lights don't work). You can't travel far on the Camino Austral without seeing chipped windscreens, mangy barking dogs and the car sticker saying "Patagonia sin represas". Meaning Patagonia without Dams, the campaign is aimed against a multi-billion dollar project to build dams on several of the rivers in Chilean Patagonia. The company which wants to build the dams, Hidroaysen, hopes to provide hydroelectric power to cope with Chile's increasing energy demands, not least because of mining in the north. The environmental problems stem from the building of the dams, the building of the power lines. There are also many controversial political and social issues asociated with the dams such as people who were offered insentives to live down here in the 60s and 70s (for political reasons) now being offered insentives by Hidroaysen to ship out again. 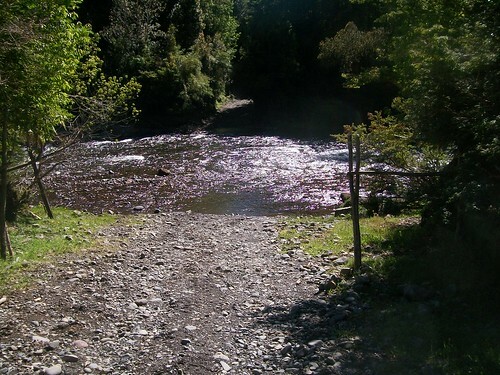 Another issue is the improvement and extension of the Carretera Austral itself. Especially a proposed 100 million dollar extention through Park Pumalin (and Park Pumalin). The park is owned by a North American entrepeneur, Doug Tompkins (of The North Face fame) who has got himself deeply embroiled in conservation work down here. See here here here. He and his wife have bought up 900,000 hectares of Patagonia. The origional plan was to run the road straight through the park. Tompkins is arguing for a more sympathetic coastal route. It is worth noting that before the building of the road very few people lived here at all. In fact, several of the towns I have stayed in are younger than me!! The Carretera Austral was the brainchild of General Pinochet with the aim of strengthening Chilean sovereignty in the region. Especially with the development of border disputes with Argentina in Laguna del Desierto much as the Beagle conflict. In 1976 more than 10,000 soldiers worked in one of the most expensive engineering projects undertaken in Chile and also one of the most difficult, due to glaciers and fjords. Many soldiers died of explosions during ground-breaking. Much of the road is still unpaved but, even whilst I ride it, the asphalt creeps out further from Coyhaique. Also there are plans to extend the road to Region XII (Magallanes). This seems to me frankly a bit ludicrous as the plan involves 935km of new road, with 9 ferry crossings, when a perfectly good road already exists (albeit running through Argentina). I have a suspicion that if I come back in 20 years, this road will all be asphalt, there will be few if any gauchos and there will probably be Macdonald´s Restaurants in every town. There are not many wilderness areas left in the world and you wonder how long Patagonia has left. Another North American environmentalist with links to Patagonia is the owner of the Patagonia clothing company, and Doug's friend, Yvon Chouinard. A film about a climbing and surfing trip the American pair made in the sixties is released this year. It is called 180 degrees South. Here is the trailer. 180° SOUTH from Mark Kalch on Vimeo. I suppose the caveats are that these men are now extremely wealthy, they are not Chileans and they can have a very heavy handed approach. They are charactarised as being "Eco-barrens" and in turn Hidroaysen are nicknamed "those dam monsters". Here are some websites to look at if you are interested. I think its a good idea to use the excuse of the calendar clunking around each year to reflect on what you would like to achieve for the next year and make some firm commitments. And add a few that are new. What more can a poor man do? Okay, here are mine for 2010. 1) Learn a new word of Spanish each day, including a verb each week. 2) Climb a mountain each month. 3) Don't get a haircut, man. Eat at a table everyday. Learn a new recipe each week. Only watch TV for an hour each day. Only watch films at the cinema. Run or walk at least a mile each day. By the end of 2010 read the 10 books you have always wanted to read but have always put off. Write a diary each night. Once a week, phone your mum. Tidy your house/flat/room/tent each night before you go to sleep. Learn a new skill (language, musical instrument, art, etc) practise each day. If you are a busy and stressed out kind of person. Take an hour out each day to sit, drink tea and just "be chilled".